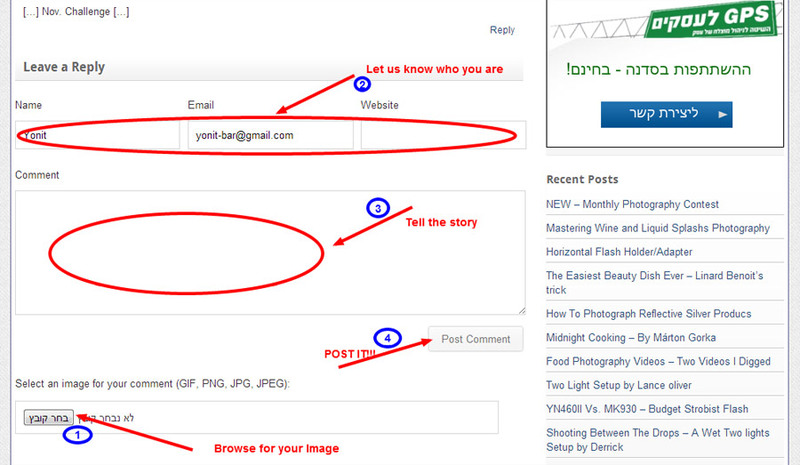 How to post image and competition rules- click here DiyPhotographystuff.info monthly photography challenge rules. Scroll down to the comments section and post your image in four short steps (image). This is my entry…shot with a single speedlight off-camera. Not much more to say than that! Sunpak 555 1/4 power bounced off white bed sheet to left. The rest of the sheet was wrapped around me for fill. Nikon D70 18-70 lens. One speedlight with a 16-degree grid. A single bare Yongnuo YN-560 at 1/2 above and left. 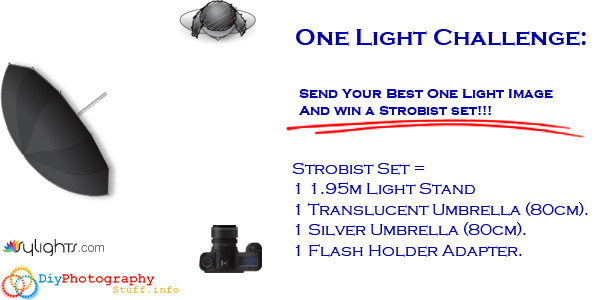 600ws strobe approx. 2ft from subject camera right with 7″ reflector. No defusion, strobe at its lowest setting 28 to 135mm is lens @ f18, 1/250. This is our nephew Justin. Strobist: 430 EXII Behind Subject camera right 1/16 bare. One SB900 bounced of the wall/ceiling as fill light. ISO: 200, 85mm, F3.5, 1/125sec. As part of a natural beauty look. The picture is mainly unprocessed besides some straightening and cropping. A strobist shot taken years ago. One of my first exercises with off-camera flash. During my trip back in my old stomping grounds to visit for the holidays I was able to schedule a shoot with a young lady that I had worked with previously. We ventured out to Fort Washington, which was one of the forts built to protect Washington DC from water based attacks from the south. In this shot I placed a speedlight triggered by a PocketWizard Flex in the room behind her as a rim light to ensure that I would get the clear shadow casted forwarded. I allowed the available ambient natural light fill the front of my image.